In these times of soaring food prices, growing food in cities is becoming the big urban trend. 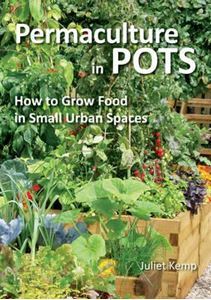 As demand far outstrips supply for allotments, Permaculture in Pots shows you how to get started with whatever space you have available- appealing to those who feel powerless to meet their own subsistence needs through lack of growing space. Month by month we learn what to grow on a balcony or in a container garden, using low impact permaculture principles. It doesn't matter when you pick up the book and start your journey of container gardening- wherever you are in the year, open the book to that chapter and it'll tell you what you should be doing. Each month's section details chores to be done; how to plan ahead for the next season; and which fruit and veg to be sowing, growing and eating. There are recipes, photos and anecdotes from Kemp's experience growing food on her small balcony in Southwark; Kemp is warm and self-effacing and makes an excellent guide. Each month has its own herb, with growing tips and culinary and medicinal uses for each.As uncertainty rises about whether those outside the property ladder will ever get to own their own home, Permaculture in Pots gives power and opportunity back to generations who are becoming more aware of the need of self-sufficiency, and yet find themselves in rented home with concrete where gardens once were. There's no excuse not to get started!